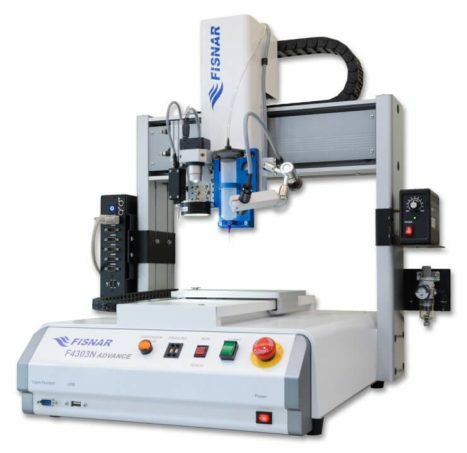 The FISF4000AKIT-VISION Camera Vision System for Fisnar ADVANCE Series Dispensing Robots is a modular, plug and play add-on to any of the ADVANCE series liquid dispensing robots. 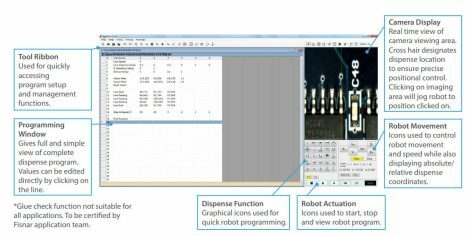 This robot vision system provides a powerful and intelligent CCD vision-based programming and fiducial auto-adjustment system for creating both simple and complex dispense routines/programs. This results in improved quality due to precise dispense positioning alongside improved production yield and reduced processing time and costs. Dispense programs are created quickly and easily in the Fisnar proprietary vision-controlled Fluid-In-Motion (FIM) software by using the displayed camera image to move the robot to the exact required dispense location, and then selecting the operation wished to be carried out (dispense, dot, line, start, etc). 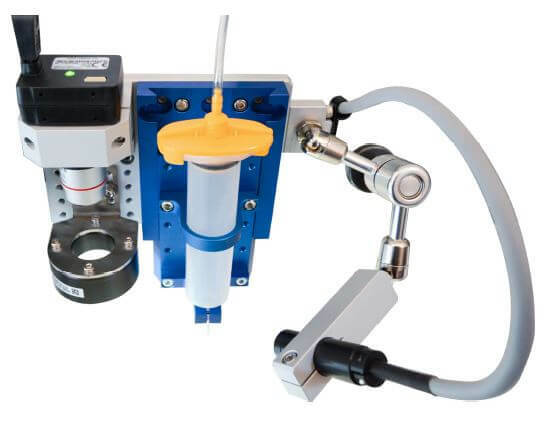 The FISF4000AKIT-VISION robot vision system software is supplied with an auto-part alignment function to guarantee fluid is being dispensed at the exact required location. This is achieved by the system capturing an image of two separate fiducial locations on the component and using pattern recognition software to compare the live image against a stored image. Any difference found in X or Y position results in the dispense coordinates being automatically adjusted to suit. Dispense positional accuracy and repeatability is further optimised by the simple auto-calibration routine and part alignment function. Highly robust and durable based on cast aluminium base and heavy duty extruded aluminium twin vertical side pillars supporting the horizontal X-axis. This rigid design concept allows for long term precision dispensing and dependable repeatability. Industrial specification PC installed with Windows 7 and supplied with Fluid-In-Motion (FIM) software ready to use. Mounted directly onto robot to reduce overall envelope. TFT LCD monitor, keyboard & mouse also included. For high resolution colour & greyscale image capturing. Displays an 8x6mm real time image on Fluid-In-Motion (FIM) software. Alternative focus lenses available for special application requirements. For optimising image contrast and definition. Adjustable light brightness controller is mounted directly onto robot to reduce overall envelope. Works by the camera capturing an image of the purged fluid and uses pattern recognition to compare it against a pre-defined datum image. Any difference found between the centre positions, result in the X & Y co-ordinate values being automatically adjusted and dispense program re-aligning to suit. 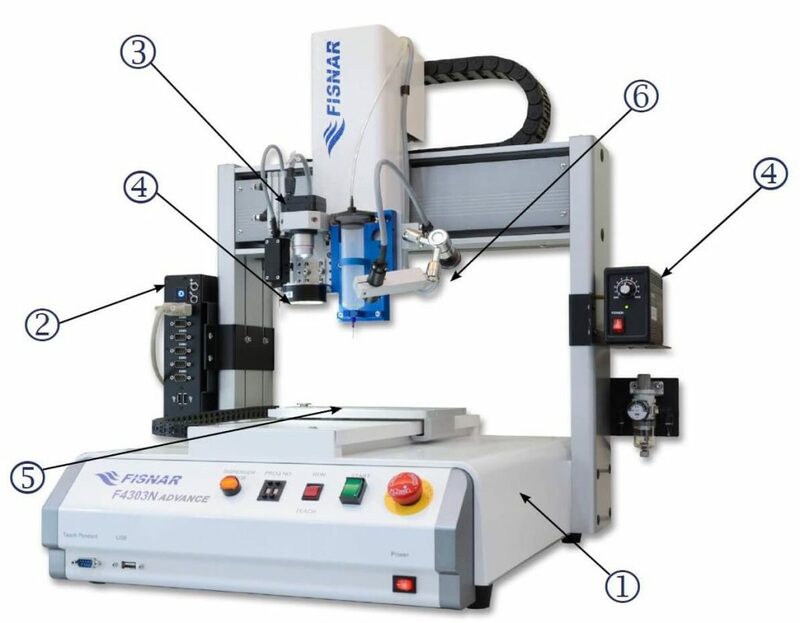 The Z-axis is automatically calibrated by dispense tip contacting a touch pad. 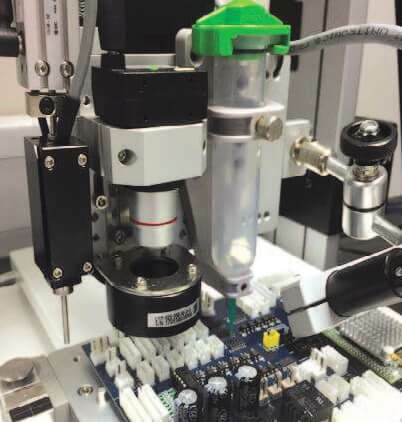 When robot is running a dispense cycle, a live full screen image is displayed on the TFT LCD monitor, allowing the user to clearly and easily monitor the fluid is being dispensed correctly onto the component part. This ensures any errors can be quickly identified. 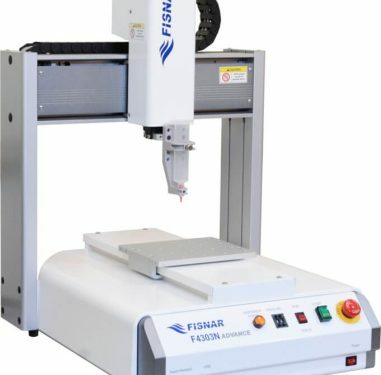 The Fisnar F4000 ADVANCE Series of Benchtop Fluid Dispensing Robots are compact, self-contained and economically priced. 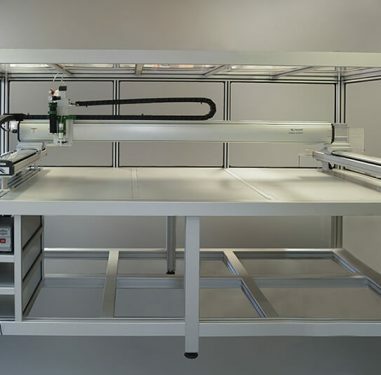 They are optimised for dispensing virtually all types of fluid material and can be automated for simple tasks as well as high volume production.